By the 1890s the name of Flying Bull Lane had been erased from maps of Portsmouth in favour of Garfield Road which although straightened and urbanised retained essentially the same position as it's predecessor. The road was one of the older lanes in the vicinity, though nowhere near as ancient as Kingston Crescent, it's neighbour to the north. It had probably served as a trackway between ancient furlongs on Cherry Garden Field but it did not feature on any map before 1845 when The Tithe Map prepared by Thomas Ellis Owen was published (see below). On this map we can see several houses and farm buildings which suggests that it must have been in existence as a viable road for some years prior to that date. Local legend has long held that this road was named after the first balloon flight in Portsmouth, c1784, which allegedly took off from a spot close to the site of the Air Balloon Public House (at the Commercial Road end of Flying Bull Lane). It was said that in order not to endanger human life the only passenger on this flight was a bull. The balloon was also said to have travelled as far as Rake, north of Petersfield, landing close to a public house named the Flying Bull Inn, which still exists. Historical evidence for this flamboyant story is sadly non-existent; no newspaper of the period nor any later historian even mention the incident. This not unduly surprising since the alleged date is rather early given that the first ever manned flight of a balloon didn't occur until early in 1784 when the Montgolfier brothers ascended from a site in Paris, having, the year before sent a sheep, a duck and a rooster aloft to test the effects of altitude on their anatomy. Locals around Rake say that their local pub, the Flying Bull, has never been connected to any balloon story, whilst in 'The Portsmouth Road' by Charles Harper writing in 1895, tells of encountering an old local man who said he believed the original name of the pub was 'The Fly and The Bull' after two stagecoaches plying their trade between Portsmouth and London on the route through Rake. Roger Chatterton-Newman, a local historian, has researched the name of the pub and is satisfied that there were no stagecoaches by the name of Fly and The Bull and goes on to assert that the name derives from "the crest of the Cole family who owned Lyss Place at West Liss from 1546 to 1807, and whose estate the Flying Bull (and much of Rake) was part. The crest was a bull salient, sable, winged and gorged or, in other words, a winged and leaping black bull with a golden collar. The pub is mentioned several times in the Coles' papers". Roger does not know whether the Coles family owned any land in Portsmouth but it has to be a possibility. He was also able to say that the first balloon flight in Hampshire took place, according to Gilbert White's journal, on 16th October 1784 when a Mr. Blanchard flew over Selborne and landed at Romsey. Lastly, and perhaps most appositely, the logic of launching an inaugural flight with a bull on board hardly makes sense when one considers that a bull was likely to weigh in excess of 500kg at a time when balloons were only capable of lifting the weight of one or at most, two men. So, what are we make of the name? We can be reasonably certain that the names of Flying Bull Lane and the Air Balloon public house are linked and that they celebrate the early balloon flights. Further, it has been suggested that 'Bull' should be read as in a similar context to that of the bull on an archery target, in other words, as a simile for 'first', allowing us to interpret the name as 'First Flight Lane'. At this point, there being no conclusive evidence, we can but note the possible explanations for the origins of the name. The Thomas Ellis Owen Tithe Map and it's associated Schedule of owners and occupiers allow us a first glimpse of the character of Flying Bull Lane and the adjoining lands. The Schedule tells us that one of the major land owners in Portsmouth, Thomas John Ridge, owned most of the land on both sides of Flying Bull Lane in 1845 and that to the north it was occupied by William Silverlock who was using it for arable farming, whilst on the south it was meadow land occupied by John King and John Knight. In addition to the land owned by Ridge, there is a field containing what is probably a farm building on the north side at the western end. It was owned by William Deacon and others and farmed by John Davies. Further east is a block of 6 cottages but no other buildings on the north side. South of the lane, at the west end there appears to be one large house, a farm building and two blocks of cottages comprising of possibly nine dwellings. Towards the eastern end there are two further blocks of cottages. The 1841 Census lists 16 households on Flying Bull Lane. The occupants range from John King, a 70 year old brickmaker, James Cleaver, William Cook and William Hill, labourers, John Spreadbury and John Crossland, blacksmiths; Jeremiah Journeaux, Army Pensioner; Joseph Rowe, gent's servant; Mary Ann Drew, bonnet maker; James Theridge and Frederick Payne, tanners; Thomas Turner, Navy Pensioner; Thomas Way, rope maker; James Gunter and Martha Mansbridge, independant; Sarah Elcock, schoolmistress and Samuel Sparks, mariner. None of them were registered on the List of Burgesses (Electors) for All Saints Ward in 1841 which suggests that the dwellings were all of low value. Immediatly following the returns labelled Flying Bull Lane in the census there are five entries for Gambo Alley. It is not immediately apparent whether these should be considered to be part of Flying Bull Lane, but without them the number of dwellings does not match the number of households. The inhabitants are Mary Jervoise, widow; George Burridge, agricultural labourer; Richard Holland, brick business; Mary Carteridge, widow; John Burridge, gardener. By the time of the 1851 Census the only occupants to have stayed on since 1841 were John King, now 82 and described as a builder, James Cleaver, John Spreadbury and Thomas Way. The rest ranged across a similar range of occupations as in 1841 with the notable addition of a musician (Charles Heltchhawser) and a shipwright (John Urry). Again, none were registered as burgesses. Occupants of Gambo Alley are not recorded separately as in 1841. Ten years later, at almost the same time that the 1861 Census was called, the Ordnance Survey produced it's first detailed map of Flying Bull Lane (see below). From this map we can see that there had been only modest change since 1845. The only significant developments have been the construction of a new block of dwellings on the north side towards the west and another towards the east end. The former block consists of three tenements with a passage between the second and third leading to the back of the property where there are three cottage sized structures. The latter contains a block of seven new dwellings. We can also see that on the south side of the lane towards the east there is a block which is labelled Gambo Alley, which confirms the suspicion derived from the 1841 Census. The 1861 Census records an almost 100% turnaround from the inhabitants ten years earlier with only Thomas King, the son of John King, still living on Flying Bull Lane. Unlike the two preceding census years, in 1861, there are 11 people giving their address as Flying Bull Lane who appear on the List of Burgesses, though several of them do not appear on the census [marked *]. George and Thomas* Barfort, James Bull*, John Burden, John Caught, Charles Heather, John King, William McPherson, Richard Savell, Thomas Setford and John Smith*. It is interesting to note that the number of new dwellings in 1861 closely matches the number of Burgesses registered in the same year. It is tempting to assume that these homes were built to a higher standard and therefore fall within the £10 franchise neccessary for qualification to register, but it would be difficult to prove. This census seems to indicate a drop in the number of households on Flying Bull Lane itself, though not on Gambo Lane/Alley. The census enumerator has not indicated that there are any unoccupied buildings so we must assume that some of the original low value buildings were no longer used for human habitation. The 1881 Census illustrates the beginning of the end for Flying Bull Lane as the inevitable urbanisation that had been creeping north across Cherry Garden Field for the past half century finally reached it. The road itself is still listed but many of the earlier buildings must have been demolished, particularly on the south side as Centaur, Nessus and Hercules Streets, all of which have junctions with Flying Bull Lane are represented. Opposite the end of Centaur Street there was a block of dwellings called Atalanta Terrace (presumably named after HMS Atalanta which was lost in 1880). The occupants were William Middleton (dealer), John Birmingham (Baker), James Thorp (Naval Pensioner), James Dykes (Retired Boatswain), Elizabeth Wade (No Occupation), Cornelius Hershan (Engine Fitter), Robert Brewer (Carpenter) and Anne Eastham (Independent). Listed on Flying Bull Lane itself were eleven dwellings within which a range of pensioners, naval personnel and labourers lived, but it is not possible to determine their precise whereabouts on the lane. By 1891 the redevelopment of Flying Bull Lane was complete with the census listing 49 households (Even numbers to 60 on the south side and odd numbers to 37 on the north). 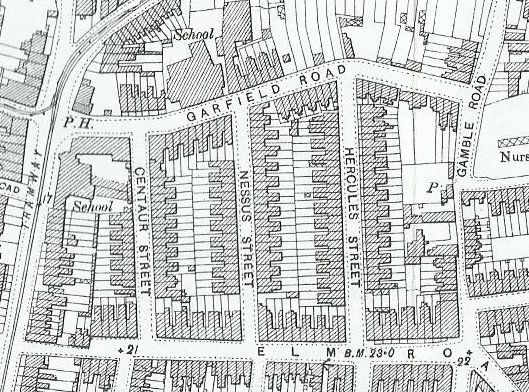 In 1896/97 the name of Flying Bull Lane finally gave way to Garfield road (see a section of a map from 1898 below) to leave the Air Balloon public house as the sole memorial to the earliest days of manned flight. Although the name of Flying Bull Lane was consigned to history, it lived on in the name of a school on the north side of the road (see above). It is believed that the school opened in 1884 and survived on that spot until 1976. That would have been an appropriate moment for the name to finally disappear, but in 1997 a school located near the earlier junction of Centaur Street and Elm Road which had formerly been known as Buckland First and Middle School changed it's name to Flying Bull Primary School and will become Flying Bull Academy in April 2014. To Stephen Pomeroy, Roger Chatterton-Newman and Deamonn Hewett-Dale for additional information.